This page focuses on the orchids in the fall season. Check out this page here for more information on orchid care. In the fall the weather turns cooler. 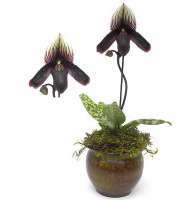 Orchids, like most plants need different care in the cooler months when the light begins to decline. The daylight becomes more limited and the sun gets a little lower in the horizon. There are changes that you will start to see with your orchids. In general, in the orchids fall season because of the decrease in daylight you will need to water less frequently and also decrease the use of fertilizer. This is the time of the year that orchids reduce their metabolism for the most part. The orchids fall season for Phalaenopsis orchids is critical for initiating bloom spikes. The ones that are in your home or garden enjoy the weather change and they mostly enjoy the variation in temperatures. In order to stimulate blooming again this variation in temperature is needed. Also, to get them ready for blooming you need to get a fertilizer with more phosphorous in it. This is the so-called a "blossom booster". Start this one during the next several month and then well into the blooming period. The fall season of orchids is on us. Here is another suggestion if you will be bringing orchids indoors after being out in the garden for the spring and the summer. Consider using a copper based compound (a fungicide)to spray on the orchids to prevent "rot". It also might be wise to use an insecticide of some sort to reduce any population of pests. This is the season where disease and pest can damage your orchids. 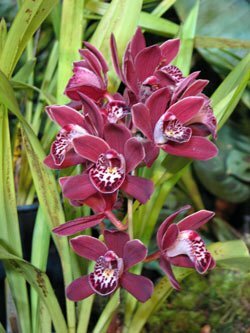 Cymbidiums are a group of orchids that can start initiating flower spikes in the Fall season. Some of these are fragrant and can have and can have large flowers. The Cymbidium flowering season can last several months. There are miniature Cymbidiums as well. Since some of them are large flowers and with many on a spike you will need to stake the flower spikes to prevent them from breaking and to allow them to show their best. Now that they are flowering one should consider getting back to a balanced fertilizer. This is also the season for Paphs. to show their brilliance. They enjoy the cooler climates and do much better in them. As they are beginning to flower use a fertilizer with high phosphorous, ie, blossom booster. This will help support them in this part of their growing cycle. growth. Paphs. so not like to dry out. However, be careful not to over-water either. Cut back a little on the watering so the plant will avoid root rot. Root rot can be prevalent at this time of the year for these wonderful orchids. On these orchids there is a sheath that has formed around the bud or spike. This sheath protects the flower and may be turning brown. If it doesn't fall off by itself it should gently removed to allow the bud to open properly. Be watchful for water accumulating around this sheath as it can lead to rotting of the sheath and the flower.